Keen is one of the renowned shoe companies of America which is situated in Portland. Martin Keen is the owner of this company, who started this company in the year 2003. And since then the company has never looked back. In a very short span of time it has become one of the most popular shoe brands in almost every household. Apart from different designs, Keen also produces hiking shoes which has been very popular among the hikers. Targhee is one of such hiking shoes of Keen. And Targhee is specially made for hikers. 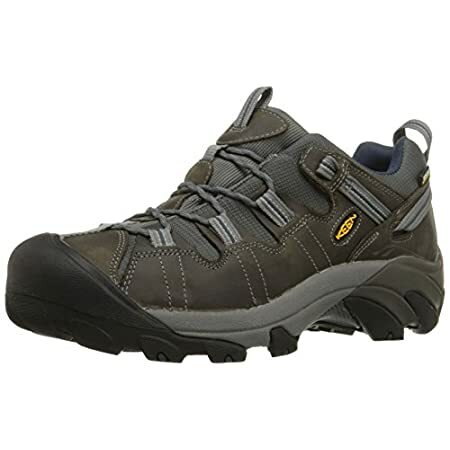 This Men’s Targhee II Hiking Shoe from Keen is one of the popular hiking shoes for those who like adventures. This is an off road shoe specially made with Targhee’s water resistant technology. The shoe came to the market in the year 2005. This pair of shoe comes in different colors and in different sizes. The shoe is not so light which makes it comfortable for trekking or hiking. The sole of the shoe is not stiff and thus very comfortable to wear. The upper of the shoe is made of water proof membrane, which has good traction. Since it is water resistant, hence the pair of shoe is comfortable to wear in snow, rain and mud as well. In all types of weather, the shoe will keep the feet dry and intact from inside. The upper of the Keen’s targhee hiking shoe is made of leather and textile. The leather is waterproof having nylon net which gives flexibility and durability to the shoe. The lining of the shoe is made with the Keen dry waterproof breathable layer. The midsoles of the shoe is made of compression molded EVA having shock absorption quality. The outsoles of the shoe are made of rubber having multi directional pulls which gives durability and grip to the feet. The shoe has a toe guard made of rubber in order to protect the feet. The foot bed of the shoe is made of ethylene vinyl acetate (EVA) polymer. The Targhee II from the company Keen is specially designed for hiking purpose. The shoe is ideal for hiking, trekking, travelling and such other off road adventures. The rubber outsoles of the shoe are made in such a way that it gives extra grip to the feet. It has 4 mm multidirectional pulls all around the shoe which gives stability and durability to the shoe. The shoe has removable EVA polymer made foot bed which can be customized according to the foot’s comfort level. It has waterproof Keen dry outer membrane with nylon net which prevents water to enter into the shoe and keeps the feet dry irrespective of terrain and weather. ​I have been a passionate user of Keen Hiking shoe. I love the comfort it provides. Specially the features of this pair of shoe are highly appreciable. After using Keen for a long time I have become a big fan of Keen Targhee II. But this time after wearing a pair of shoe one becomes loose and had to replace it. But I must appreciate that their customer service is amazing and I got the replaced pair of shoe immediately. ​Till now I have best experiences with Keen Targhee. This is the best hiking shoe I have bought and I would like to recommend it. The sizes come accurately and so needs no insoles. ​This pair of shoe from Keen is a hiking shoe. The shoe is suitable for those who like adventure in life. This pair of shoe is perfect for trekking, mountaineering and such other off road adventures. The shoe is made of leather having nylon net and purely water proof. So this pair of shoe is perfect for any wet weather as it prevents water to enter into the shoe. This pair of shoe is specifically designed to keep the feet dry. The out soles of the shoe perfect grip to the feet of the wearer. So this pair of shoe is suitable for those who love adventure and want to spend much time outside.